I hate to be the one to break it to you, Georgia Southern Hawaii Navy Georgia Tech fans, but I think you’ve hit your ceiling. It’s time to accept the hard truth: your one-dimensional, gimmick, high-school offense has done all it can do for you. For your team to rise to the next level, they need a balanced offense. Without one, you’ll never win the Southern Conference a I-AA national title in Division I-A the WAC the Commander-in-Chief’s Trophy bowl games a BCS conference a national championship. Sure, you think you’ve seen some success with this cute little scheme, winning 4 I-AA titles winning Hawaii’s first-ever conference championship taking Hawaii to the first two bowl games in the school’s history taking a winless service academy to 10-2 and #24 in both polls in 3 years ending a 4-decade losing streak to Notre Dame winning the ACC last year. And sure, you guys beat Furman Youngstown St. Montana BYU Illinois Cal Rutgers Pitt Wake Forest Notre Dame again Georgia with it. But this is different. The spread option isn’t a real offense, and once it sees the speed of a Big 10 ACC Big East SEC Big 12 Pac 10 BCS defense, it’ll be shut down. To win a national championship, you’d probably have to beat a more talented BCS team that will have a month to prepare; and we all know that is never going to happen. Let’s hope they keep misunderestimatin’ the gimmick. It’s hard to single out Dinich for just repeating what countless others have said countless times. Even if it’s terribly, terribly wrong, which everyone should know by now. of course, but you’d think she’d do a little more research than simply banging out the same ole lang syne about balance and one-dimensional offense. Didn’t the Air Farce say the same thing about the Marine Corps back in 1947? Is that you LtCol Deeds??? I can neither confirm nor deny! LOL it’s Licari! Double D! From Camp Fallujah 2007…Lessons Learned. Heather did say one thing correctly. “This offense needs to pass more efficiently.” Of course that can be said for any offense. Is that a pic last year’s Navy-Notre Dame game where Ricky made the correct read of the defense and handed off to Murray for a TD? 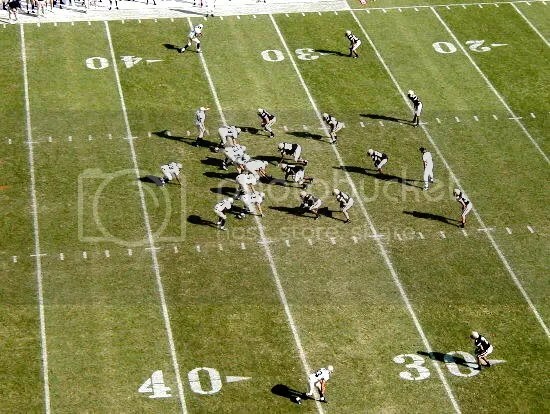 That’s actually Navy at Vanderbilt in 2003. LOL! Keep up the great work Mike. Can’t wait to watch announcers justify why Nesbitt and Dobbs don’t deserve Heisman recognition this year because of their ‘gimmick’ offenses. Go Mids and GO JACKETS!!! This post is the end of the internets for the day. Nothing on the interwebs can surpass it, so we’d might as well give the intertubes the rest of the day off. Great post… but GSU actually won 6 championships thanks to it. Thankfully GSU is finally returning to our old ways! Good luck to all of the PJ disciples this year. 4 with Johnson, which is the point of the post. No, hee haw. 6 with Johnson, as he was Erk’s OC for the first two NC’s. No, hee haw. 4 with Johnson, as he was in Hawaii in 1989 and 1990. Everyone calls it the “spread option” and I guess technically it is. However, not in the same way that one would think of as with the Urban Myer or Bob Kelly offense or the Hal Mummy, Mike Leach, Chris Hatcher “dink-n-dunk” spread. I look at it more as the “Run & Shoot Option” as the Run & Shoot was what it was developed out of. In fact more “run & shoot” down field passing would and has developed great balance when incorporating with the running attack of Coach Johnson’s Offense. I call it what Johnson calls it.